Barbecuing spare ribs that are tender, juicy and succulent is a time-consuming but rewarding process. Ribs need to be cooked a long time over a slow, indirect heat. Here's how to barbecue ribs low and slow on a gas grill. Be sure to use wood chips for smoking since there's no charcoal fire to add a smoke flavor. The keys to success: 1) Trim spareribs to "St. Louis cut" or use baby back ribs, 2) use a dry rub, 3) Cook low (225F) and slow (4-5hrs), 4) keep a pan of water inside the grill and 5) be Patient! Start off by putting a pan of water on the burner grate (the platform under the cooking grid and above the burners). Fill the pan to within a half inch of its top with water. This helps keeps the meat moist while cooking. You will be using the indirect method of cooking. So the ribs will be on one side of the grill and the fire will be on the other. If you need the entire grill to cook on, you can put the water pan over the lit burner and cook ribs over the pan of water. Just make sure the ribs do not receiving direct heat from the burner. If cooking spare ribs, trim the ribs. 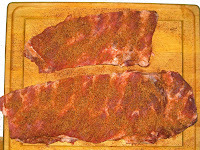 See the "Trimming Ribs" post to trim spareribs to a St. Louis cut. This step is important for the ribs to cook evenly and look delicious. If cooking baby back ribs, just trim any excess fat off the ribs. Rub the ribs with Merlin's Magic Rub (see separate recipe) or another dry rub just before cooking. Spread a thin layer of yellow mustard on the ribs first to act as a "glue" for the rub. The mustard won't affect the taste but will hold the rub in place. Don't skimp on the rub! Ribs should be cooked at a low heat, around 225F. Use a good oven thermometer and keep it on the grill near the meat. Do not trust the built-in thermometer on the grill. I use a Maverick ET-73 remote thermometer and it's great! The ribs will take 4-5 hours to cook at 225F. I used to par-boil ribs before putting them on the grill to cut the grill time. But they lose taste and texture with boiling and, although they become "fall-off-the-bone" tender, they actually are a little mushy. When you cook ribs low and slow on the barbecue, they will be scrumptuously tender, tasty and amazing. My ribs will never touch water again! On a gas grill, use wood chips for great smoked flavors. Soak the chips in water at least 30 minutes and then put them in a smoker box or wrap tightly in aluminum foil with holes punched in the foil. Put them on the burner grate 15 minutes before starting the ribs so you get good smoke from the beginning. Replace with more wood when it stops smoking. Do this two or three times in the first two hours of cooking. After that the effect of smoking reduces considerably. Almost done. Water pan under the ribs. Cook with the grill covered so that the gas grill, in effect, becomes a smoker. Start the fire about half an hour before putting the ribs in order to begin regulating the heat. Adjust the heat as needed to maintain 225F. Be sure the ribs never receive direct heat and that the water pan always has water. Use a remote thermometer so you don't have to open the grill cover to check the temperature. Every time you open a gas grill cover you'll lose cooking time. A lot of people wrap the ribs in foil after a couple hours of cooking. I've tried it. I still not only like the ribs without wrapping, but it's much easier to cook without the effort of wrapping halfway through. Ribs are done when they are done. Seriously, they will take 4 hours (baby back ribs) to 5 hours (spare ribs). A good and reliable test is the "bend test". Pick up a slab with a pair of tongs. 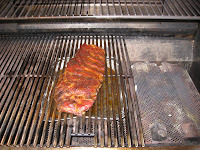 If the ribs are ready, the slab will bow and the meat will slightly crack on the surface. Take them off the grill at that point! I generally don't sauce the ribs on the grill. I'll serve them "dry" and let everyone choose their own sauce at the table. But if you do brush the ribs with sauce on the grill, wait until the ribs are done. Remove the pan of water from the grill so you have direct heat. Brush the ribs with warm sauce and grill over medium heat for 2-3 minutes on each side. Make sure the ribs don't burn! If you sauce earlier, the sugar in the sauce will burn while cooking, which is not a pretty sight. I sometimes cook the ribs way ahead earlier in the day. Just before eating, put the ribs on a hot grill to warm them. That makes the process easier and you still serve piping hot, tasty, succulent ribs. Cut the ribs cleanly with a good, sharp knife, serve with extra sauce, grab some napkins and get down to some delicious eating! You will love it. A fun day with BBQ, wonderful company and amazing ribs!